SoulMade Simulations has posted more preview renders from the de Havilland DHC-2 Beaver for X-Plane. Ramzzess has posted more preview screenshots from the Beriev Be-200 project for X-Plane. Eagle Rotorcraft Simulations has posted a short preview video from the soon to be released Bell 206B JetRanger III for FSX. - Navigation in FMS works with the Flightplan generated by FSX flight planner. - Fully animated Gears, Flaps, etc. - Ground Service Equipments on the apron. - SLG (Semi-Levered Gear) systems are animated. FSBreak episode 100 with Eric McClintock, Nick Collett, Chris Palmer and Brendan Farmer is now available. Laminar Research has posted more landscape previews from the upcoming X-Plane 10 flight simulator. 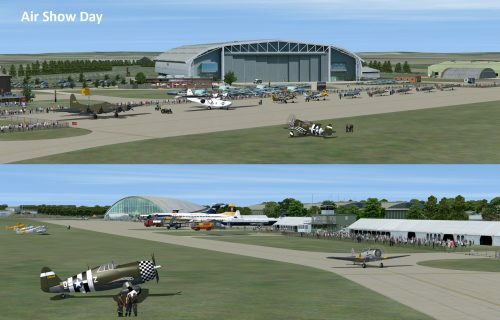 The Airfield Construction Group has released the freeware IWM Duxford Aerodrome (EGSU) for FSX and FS2004. The freeware Murmansk Airport (ULMM) version 1.02 for FS2004 is now available to download at AVSIMrus. Aubrey has posted more virtual cockpit preview screenshots from the soon to be released MD-902 for X-Plane. The freeware Trieste Airport (LIPQ) version 2.1 for X-Plane is now available to download at X-Plane.org. Taxi2Gate has released Manuel Crescencio Rejón International Airport (MMMD) for FS2004. Available at SimMarket. McPhat Studios has posted another comparison from the upcoming PMDG 737 NGX High Definition Textures. MilViz has posted the first virtual cockpit renders from the upcoming North American F-86 Sabre. Orbx has posted new preview screenshots from the upcoming Goheen Airport (W52) for FSX. Drzewiecki Design has posted another preview picture from the upcoming Kraków Balice 2011 (EPKK) scenery.
" The logic for determining the available sceneries has been completely rewritten. Now, an arbitrary number of sceneries is supported, and the order in which they are considered should exactly mimic FS9's behavior. Previous versions supported a maximum of 999 layers, and may have gotten the ordering wrong under certain (unusual) conditions. This version also fixes a glitch accidentally introduced with version 2.3.0, where a debug message would be unconditionally displayed if the tower settings for TNCM were changed using autower.ini." Vertical Reality Simulations (VRS) has released update version 1.2.0.1 beta of the F/A-18E Superbug for testing. The freeware São José dos Campos Airport (SBSJ) for FSX is now available to download at Terra Brasilis. ArezOne-Aviation Soundstudios has released the Beechcraft A36 Bonanza SoundSet for FSX. Digital Combat Simulation (DCS) has released the updated Kamov Ka-50 simulator Black Shark 2. • Network compatibility with "DCS: A-10C Warthog"
Laminar Research has posted a few more preview screenshots from the upcoming X-Plane 10 flight simulator. More preview pictures have been posted from the Denel AH-2 Rooivalk project for FS2004. Aviasim has posted new preview screenshots from the upcoming Leicestershire Aeroclub (EGBG) for FS2004. The freeware Twentynine Palms San Pedro de Atacama (SCPE) scenery is now also available for FSX. Another development update has been posted from the upcoming General Dynamics F-111 Aardvark for FSX. CaptainSim has updated the Boeing 757 for FSX to version 4.6. More details at the CaptainSim Website. Carenado has posted more preview screenshots from the upcoming Piper P46T Malibu for FSX. More preview screenshots have been posted from the upcoming Aerosoft Antarctica X scenery for FSX. Aerosoft has released the long-awaited PZL-104 Wilga for FSX. Now available at the Aerosoft Shop and SimMarket. Pierre Gallant and Jean-Pierre Fillion have released the freeware Montmagny Airport (CSE5) for FSX at AVSIM. Two more preview screenshots have been posted from the upcoming Let L-410 Turbolet for X-Plane. The freeware Project Tupolev Tu-154B-2 Beta for FSX is now available to download at the PT Website. KC Flight Shop has posted the first in-sim previews from the upcoming Republic RC-3 Seabee for FSX. - Reduced texture file size on external textures to combat FSX program crashes due to lack of system memory. - Added cockpit light to aircraft for better instrument panel visibility during a wider variety of lighting conditions. Eaglesoft Development Group is offering 10% off with use of the Thanksgiving Savings Coupon. Expires Nov 30th 2011. Enigma Simulations has posted another preview picture from the upcoming Boeing 737-300 for FSX. Baja Sim has posted more preview pictures from the upcoming La Paz, Baja California Sur (MMLP) scenery for FS2004. Computer Pilot - Volume 15 Issue 6 -November/December 2011 is now available as free PDF download. Another preview picture has been posted from the upcoming Aerosoft Antarctica X scenery for FSX. Jonathan Gabbert has posted new preview pictures from his freeware Vancouver Intl. Airport (CYVR) for FS2004. Robert Graf has released the freeware Krems Langenlois Airport (LOAG) for VFR Airfields Austria X in FSX. Virtavia has released the Boeing-Vertol CH-47 Chinook for FSX. Now Available to purchase at SimMarket.